As usual, clicking on the pictures will make them bigger. It will also make your mouse button happier. Try it. It might even make reading through the ~4800 words here more enjoyable. It seems appropriate that I post this on Bastille Day. I left off where I was boarding my Eurostar train from London which I made by about 30 seconds before check-in closed. I got off my Eurostar train after the 2 hour 15 minute ride and headed to the metro to get to my friend’s apartment. Of course, the metro I needed wasn’t directly in the station, but my phone told me it was only an 8-minute walk, so I headed out of the station (past all of the sketchy people who hang out at the train station entrance) and started following my phone’s directions. Unfortunately at some point one of the roads was closed, and I wound up getting very lost (in a rather bad neighborhood of Paris). I eventually found my way to the metro station about 20 minutes later, and I was on my way. At this point I knew I was in a bad situation, and there wasn’t much I could do about it… If I tried to leave immediately, I was worried he would simply wait for me (or someone else to return), while if I went up to the apartment, I knew he would force his way in (or worse). I decided my best chance was to go up to an apartment that wasn’t mine, so I climbed up one flight of stairs with him following and tried to open one of the doors that wasn’t mine. I kept one hand on my wallet the whole time, and after trying to look confused and shaking my head, I bolted back down the stairs trying to get him to follow me. Sure enough he did, and once I got him to leave the apartment complex, he continued following me. I eventually ducked into a nearby hotel while his view was blocked by a group of teenagers, asked to use the bathroom, and spent 10 minutes waiting there before exiting the hotel with a large group of people. I had lost him, and was able to safely return to the apartment. While this experience was rather scary, it was a good wake-up call for me. I had just spent the beginning of my trip in Scandinavia which was extremely safe. Even the UK is relatively safe, and I needed something like this to happen to remind me to be more careful with my surroundings (especially in somewhere like Paris). I was glad that I didn’t need to have anything stolen to learn the lesson, and I remained vigilant throughout my entire time in Paris. Sadly, Paris is a city where you really do have to pay attention at all times… Once I had learned this the hard way, I was perfectly fine. I even enjoyed teasing some of the criminals and pickpockets toward the end of my time there – It’s all part of the experience and the fun. Before I continue further, I ask you to read these two fantastic short pieces by the Onion: Area Man Spends Summer Having Wallet Stolen Across Europe and Going to Tops of Things Still Favored By Nation's Tourists. The first is an all-around wonderful piece, and the second is an excellent description of a lot of my time in Paris (and several other cities). Now that you've completed your required reading, let me begin. After the apartment scare, I calmed down for a while and researched what I wanted to do over the following days then went to bed early. Since I had a lot of time in Paris, I figured it'd be a good start to get my bearings with a walking tour. Sandeman's New Europe offers a lot of free walking tours across Europe (of course, they aren't really free -- you "tip" the guide however much you feel their tour was worth), and I decided to try out the morning one. The guide was entertaining but a bit lacking in her knowledge of history, but her glaring failure was in keeping the group together: Multiple times during the tour this one Indian family wandered off to take pictures (or took 20 minutes when the guide clearly said 5), and she continued to wait and delay the tour for them. By the time we finished, the tour ran about 45 minutes longer than planned and everyone was super-annoyed at the Indian family for delaying things so much. How much of this was the guide's vs. the family's fault isn't clear, but it definitely meant the tour wasn't as enjoyable as it could have been. Still, we covered a lot of major sights (without going inside of course), and I learned my way around some of the main touristy areas. We walked over the bridge with all the locks. Here's something Romantic: They have to cut off all the locks at least once a year, otherwise the bridge is at risk of collapsing from all the extra weight. Since the tour ran long, I had a bit less time than I had originally planned... I decided to do the Army Museum and Napoleon's tomb for the afternoon, and that was fun. I realized that army and armory museums generally aren't my thing, but there were still a couple interesting exhibits. After I went through the museum, I headed across the complex to Napoleon's tomb, held in a gigantic basilica-like building. When I die, I'll be content with a building half the size. There isn't really much else to say about Napoleon's tomb. It's practically a temple erected for him. It was fun later on in my trip to visit some of the countries he invaded and see their drastically different opinions of him. France, however, pretty much worships him. After I finished up at Napoleon's tomb, I walked the full Avenue des Champs-Elysees, starting from Place de la Concorde and finishing at the Arc de Triomphe. It was a pleasant walk of about 2km, and anyone who knows me won't be surprised that I didn't go inside any of the stores. I wasn't even tempted in the slightest, except maybe to laugh at the outrageous price tags. After I returned to the safety of the little pedestrian island, I finished crossing the street. Then I wondered how to get across the very busy 6-lane roundabout to reach the Arc. I noticed there were chain-like barricades around almost the whole thing, which didn't really make sense at the time. I saw no crosswalks and no traffic lights to enable pedestrians to cross, and I saw no other way to get across. Of course, I now know there is an underground tunnel which takes you under the roundabout and allows you to reach the Arc safely, but I did not know that at the time. I knew there had to be a way, but I wasn't sure what it was, so I ran. Yes, I ran across the 6-lane roundabout and jumped over the barrier while a bunch of tourists turned to watch in horror. Right when I reached the other side, a very young Chinese boy said to me "You know, there is tunnel" and I contemplated jumping back into traffic. Remember that Onion article about tourists going to the tops of things? Yeah, well, I wanted to go to the top of the Arc. One of the best parts about going to the top of the Arc is the view of the Eiffel Tower, and one of the worst parts is the stairs. 284 to be exact. Well, I like going to the top of things, so off I went. The stairs steadily got narrower and narrower, but eventually I emerged into daylight with an excellent view of the city. Somehow the walk down seemed a bit more pleasant, although it was pretty easy to get dizzy. Back on the ground, there was a ceremony of some kind going on around the eternal flame which I watched for a while, then I did a bit more walking before retiring to the apartment, where my friend had prepared a fantastic French dinner. Lines, lines everywhere. I visited several of the most popular attractions in Paris on my second day, and I severely underestimated just how absurd many of the lines can get. Of course I timed these visits perfectly, since it was pouring rain for most of the day... Nothing is more fun than standing in line when it is pouring rain. In fact, it was so much fun that after 30 minutes of getting drenched at the Notre Dame (my first stop of the day), I made the brilliant purchase of an umbrella. Sure, I had a waterproof jacket, but my backpack was still getting soaked, as was any other part of me not fully covered by the jacket. Anyhow, my first stop was indeed the Notre Dame, and upon seeing a giant line to go in the main entrance, I did a lap around the building to see if there was a special entrance for holders of the Paris Museum Pass (i.e. me). Around one side I found a slightly shorter-looking line that seemed to lead inside. Only after waiting in this line for 30 minutes did I realize it was the line to go to the top of the church. Yes, more going to the top of things! Well, I had already made it to the front of the line, so I figured I'd do it. This one was 387 steps of fun, and once at the top, yet again, the view was pretty neat. It was actually raining so heavily that it was difficult to see the Eiffel Tower. This was the same rain that I had the privilege of waiting in for 30 minutes. Taken the day before -- My photos of Notre Dame on the second day didn't turn out in the rain. From Notre Dame, I walked to Sainte Chapelle nearby. It continued pouring rain, and yet again there was a long line. This one was about 45 minutes, and I was very glad to have my umbrella. The wait was worthwhile though, as the actual church is spectacular. Gigantic stained glass windows line each wall, and it is nearly impossible to photograph. Once I reached the top of the stairs, I didn't feel like climbing up a bunch more stairs to the top of the Basilica, and I had already exhausted my desire to go to the top of things for the day. I went down into the crypt first, and it was rather atmospheric because there was a service going on and it echoed around the entire crypt. 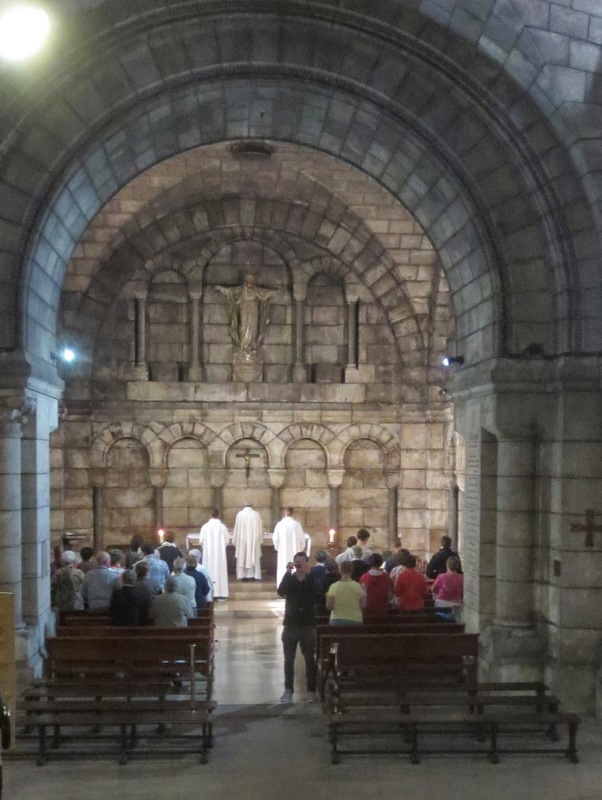 There wasn't much to actually see in the crypt, but with the service going on in the background, it was nice. Eventually I made my way back above ground and went inside the actual church. Once I got my camera back, I returned it safely to my backpack and continued down the stairs. Many people on TripAdvisor mentioned the African guys toward the bottom of the stairs who try to lasso your arm with a "friendship bracelet" and charge you 10-20 euros for it. As I went down the stairs, this one African guy tried to get one around my arm, but he couldn't, since my hands were in my pockets and I was moving quickly. He chased me down the stairs trying to tie the bracelet. In fact, I was confident enough that after a few steps I started taunting him. I shouted "try harder" and "can't catch me" multiple times as he chased me for about 300 meters trying to tie the bracelet. When he finally gave up, I turned around and waved goodbye, laughing. Seriously though, these guys are aggressive and won't hesitate to grab you, and it's terrible that the police haven't done anything about it. Being prepared for it made the experience actually enjoyable, but it's easy to see how it could easily sour one's visit to Sacre Coeur. There are plenty of places in Paris with pickpockets or other undesirable characters, but nowhere else did I see so many of them that were so aggressive. Once I made it safely to the metro station, I headed to the Eiffel Tower to meet my friend's niece, Juliette, since she wanted to go to the top as well. 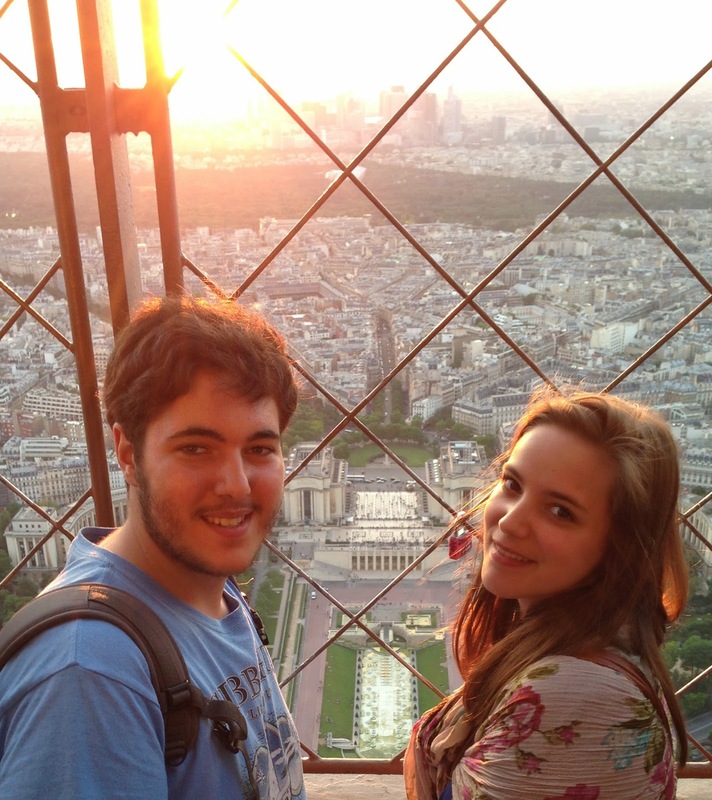 We had spent a lot of time talking in the apartment, and it was a lot of fun visiting the Eiffel Tower with her. Since the lines for the elevator from the ground were very long, we decided to take the stairs all the way to the second floor -- 704 steps of joy. The stairs to the third floor are closed to the public, but they would have been an additional 1000 steps or so. After the long hike up to the second floor, we walked around a bit, then tried to buy the ticket to go to the top floor. Unfortunately, for whatever reason, they had stopped selling tickets for an hour. We got on line though, and it was an excellent decision: 15 minutes later, the line snaked all the way around the entire second floor platform. We took turns holding our place in line and walking around taking pictures, and the hour flew by. Since we had to wait to buy tickets, by the time we reached the top, it was around 9pm. Sunset was only an hour away, so we decided to stay for it. We were very fortunate to get a perfect spot facing the Seine (and more importantly, facing west) and we staked out that spot waiting for sunset. I have so many pictures, especially since I had a lot of time to play with the lighting. There also happened to be a lock attached to the fencing near where we were standing which made for even more cool pictures. To watch the sunset from the Eiffel Tower was awesome, and I highly recommend it. Of course, it pays to go an hour or two early so you don't feel rushed and so you can secure a good spot to watch. We secured our spot about 30 minutes before sunset, and it was very worth it. We left just after sunset to beat the crowds. If we had waited much longer, I suspect we'd have had to wait 20-30 minutes for the elevator. By the time we reached the bottom and walked around for a few minutes, it was already mostly dark. We walked around for a little while longer enjoying the tower at night, then headed back to the apartment. By the time we got back it was nearly midnight, so my second day couldn't have been much fuller, but it was fantastic. 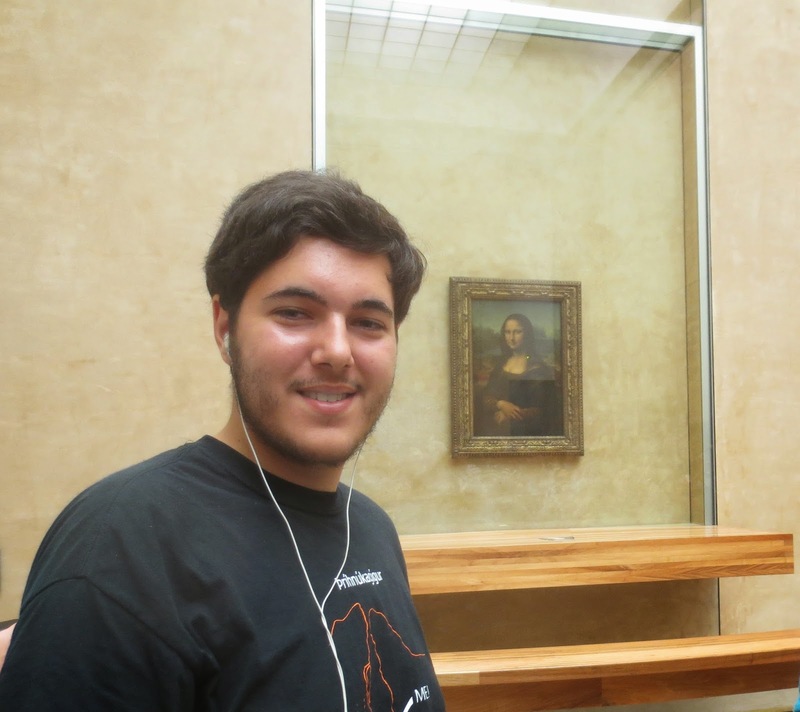 My third day, I planned to visit the Louvre. I actually started at the Pantheon for some reason, but that was a quick visit, and I was at the Louvre by noon. Anyhow, I planned to visit the Louvre on my third day because it was a Wednesday, and the museum stays open until 9:45pm on Wednesdays and Fridays. The Pantheon was a very strange building. It was modeled after the one in Rome, but had a distinctly modern and sometimes downright creepy feel to it. Many famous French people are buried in the crypt which might have contributed to the feel, but the building itself is... Odd. After I felt I had walked on enough peoples' faces, I descended into the crypt. Among others, Victor Hugo, Louis Braille, and Pierre and Marie Curie are buried here. Some of Voltaire is supposedly here too. After leaving the Pantheon, I had a quick lunch at a Tibetan restaurant nearby, then went over to the Louvre. The Museum Pass paid for itself here alone: The line to enter must have been at least 2 hours long, but instead I could simply walk right in, go through a quick security screening, and begin exploring. The Louvre has an iPhone app that I downloaded, and it included a tour of all the best-known pieces of the museum. I started by doing the iPhone tour, which brought me to all of the "highlights" along with hundreds upon hundreds of other people. I managed to get photos of most things without all the people in them though. No people in the way! After I finished the highlights tour, I visited my personal preferences of ancient Mesopotamian, Egyptian, and Greek artifacts, as well as a special exhibit on finds from early Christianity. The Louvre's Egyptian collection is amazing, as is their Mesopotamian collection. Ever since I was every young, I had always wanted to see the original tablet of Hammurabi's Code, and I wasn't disappointed! Their Mesopotamian collection had a huge room with large extremely well-preserved reliefs, sculptures, and other decorations, as well as a large variety of cuneiform tablets and other fun stuff. As always, I stayed until I was kicked out. There are still plenty more sections of the museum I'd like to visit, but I got to see many of the highlights along with many personal highlights, so I was very satisfied with my visit. I found a nice Italian place a short ways away for dinner, then headed back to the apartment. The lines in Paris are daunting at best, and hopeless at worst. I started out my last day planning to visit the Catacombs, but I slept through my alarm and didn't get there until about 11am. When I arrived, I started walking along the entrance line to take my place. I was prepared to wait an hour, but when I reached the end of the line and asked a few people, they said it'd likely be closer to 3 hours. I waited for a few minutes just to see if the line would move at all, but when it didn't, I decided that nothing was worth a 3-hour wait in the sun, especially in a city like Paris where there is so much to see. I gave up on the Catacombs, and decided to go over to the Luxembourg Gardens and Rodin Museum. I was doubling back a bit, and I probably could have been more efficient if I had planned each day more thoroughly, but I prefer to plan the travel and leave the sightseeing more informal. This style of sightseeing means I might miss a couple things or double back a bit, but it also means I can feel free to stop if I find something interesting and it means I can adjust my schedule to fit with weather, other peoples' plans, temporary closures, 3-hour lines, etc... I prefer to have flexibility in my day-to-day plans, even if I am locked into a general schedule. The Luxembourg Gardens were nice, but I have trouble getting too excited about going to a park or garden unless there is something more to see there. Sure, it's a nice place to hang out and/or relax, but again, in a city with so much to see and do, I found it sufficient to just stroll through. Once I walked through the gardens, I did a bit of wandering in some of the narrower and smaller streets of Paris, eventually winding up at the Rodin Museum. While I probably wouldn't have visited the museum ordinarily, I had seen a few of Rodin's sculptures at Stanford, and had read about the museum's impressive collection of his works. I happened to be wearing my Stanford shirt that day as well, so I figured it'd be neat to visit. Indeed, the collection is fantastic, and his works are quite interesting. After I left the Rodin Museum, I figured I'd keep with the art theme of the day. I headed to the Musee d'Orsay since they were open until 9:45pm on Thursdays. Now, I am a picky art person. Sure, I despise a lot of "modern" art, but that hardly makes me picky... I'd like to think it makes me sane. Anyhow, normally I don't enjoy much post-Renaissance art, but there are certainly some exceptions, and I figured I'd give the Musee d'Orsay a try -- After all, few other places in the world have such an extensive collection of 19th and 20th century artwork. I tried to go into the museum without much of a bias, but after seeing a few paintings of fruit, I had trouble maintaining an unbiased view. Sure, there are some very good paintings in the museum, but I realized after a little while that I just wasn't going to be able to force myself to enjoy the museum. I visited the Van Gogh exhibition and then walked around some of the museum and laughed at some of the commentaries. It bothers me a lot when people try to find symbolism or some deeper meaning where none clearly exists, and it bothers me even more when things are passed off as art that could have been drawn or painted by a 4-year-old high on cotton candy. Enough about my rant, sorry. It took a bit of searching, but I actually found a fair amount of pieces at the museum that I enjoyed. It was a pleasant way to spend an evening, and once I got over my cynicism toward some of the artwork on display, I found some I liked. Their Van Gogh exhibit was pretty nice too. I found this piece quite powerful for some reason I cannot quite explain. I left the Musee d'Orsay a short while before it closed, walked around for a little while, then headed back to the apartment to pack my things and get ready for my train to Geneva at 7am the next day. Despite my initial rocky start, I liked Paris a lot. As with any major tourist city, there are plenty of pickpockets and similar undesirables, but I felt they were more aggressive here than in many other places I visited. Keeping valuables (and myself) safe here was a bit more of a challenge than I expected, but once I realized the need to be on high-alert, I didn't have any problems (and even came to enjoy taunting the pickpockets a bit). Having friends to visit with in the evenings was fantastic, and the city itself offers such a variety of things to do. I didn't (and still don't) fully understand the stereotypical romantic image of Paris, but even without that, it is a beautiful city. Lodging: I stayed at a friend's apartment for the whole time. Her apartment was huge, beautiful, centrally located, and had everything I could have possibly wanted. Her and her family were wonderful hosts, and I had a great time visiting the Eiffel Tower with Juliette and spending the evenings talking with everyone. I can't wait to go back and visit again soon! Duration: I spent 4 full days in Paris, and of course it was not nearly enough. I didn't get to visit Versailles or the Catacombs, and I could easily have spent another day at the Louvre. There were plenty of other museums, gardens, and other places I'd have liked to visit as well, but I'll be able to do many of those when I go back next time! A week in Paris would be ideal, but it'd also be possible to visit many of the "must-see" places in 4-5 days if you planned things more rigidly (or didn't spend almost an entire day at the Louvre). I'd have liked to stay for a little longer, but at least I know there are plenty more things to see and do on my next visit. I'll pick up with my travels in Switzerland next. I went to both Geneva and Zurich, yet spent less than 12 hours in both places combined.